Grab your running shoes and get ready for the 5th annual Run for the Falcons 5k on the evening of Friday, January 12, 2018. 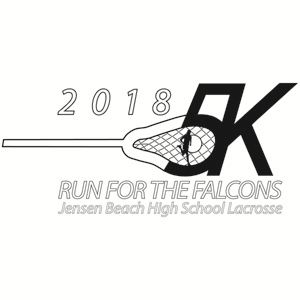 Proceeds benefit the Jensen Beach High School girls and boys lacrosse teams and 10% of the proceeds will be donated to the Kyle Conrad Foundation. 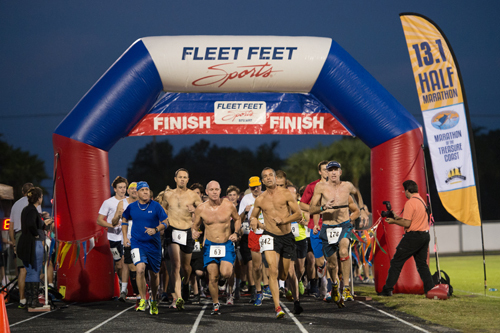 This out and back road race will begin at Jensen Beach High School at 6 p.m. and finish under the lights at Falcon Stadium where participants and their guests will enjoy live music and food from area restaurants. The course is USATF certified and features chip timing by MCM Timing & Results. Awards will be given to the overall male/female winners and to the top three males/females in each age category. The first 350 registered runners will receive a long-sleeve shirt! In addition to raising funds for the lacrosse team, a percentage of the money raised will benefit the Kyle Conrad Foundation, which actively recognizes and supports deserving high school seniors entering into post-secondary education. The mission of the foundation is to present scholarships that will go to support students that have demonstrated a dedication to academics and athletics. Race will begin promptly at 6 pm. Parking is available in stadium and surrounding parking lots of the high school. Course is USATF certified and chip timed by MCM Timing. Day of registration will begin at 5:00 pm and will be $30 cash, or check. Packet pick-up will be held on Thursday, January 11th from 3:00 - 6:00 in the school cafeteria.